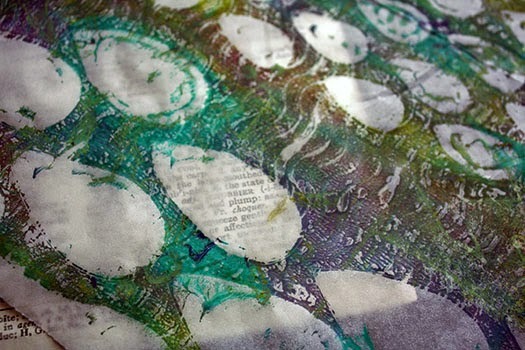 Ever since I got my Gelli Plate (maybe at some point I'll actually go into detail about what it is-sorry about that), I've been looking for different ways to use the prints other than just including them in my art journal somehow, and hoarding them obviously. I showed you how I used one to cover my bullet journal, but now I've got another really simple way to use them too. First let me say that now that I've made the plunge into art journaling, I've amassed even MORE craft supplies that need places and space in the craft room (which was already short on space.) As such, I've been looking for more ways to organize these supplies. While cooking taco soup one night, I looked at the pile of cans I'd emptied into the pot and decided to keep them. 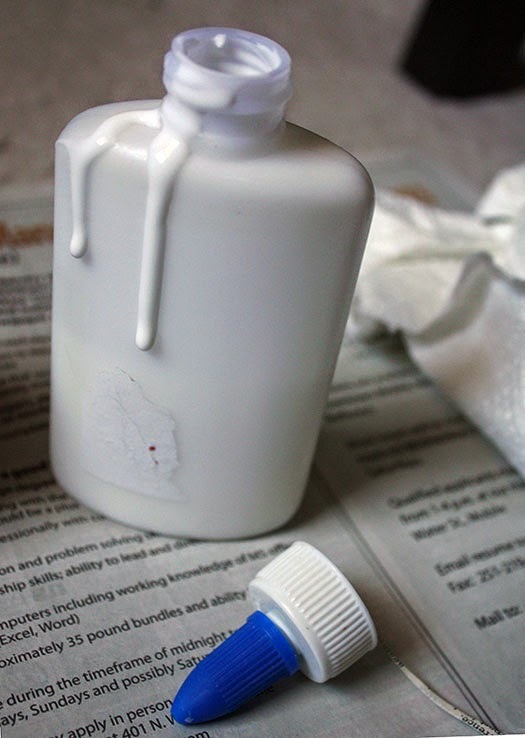 Before using the tins, I removed the labels, cleaned them with soap and water, and soaked them with white vinegar and water to remove any odors. I also hammered down any jagged portions that remained from opening the can. Safety first! I didn't bother with making sure all the glue/paper came off since I was just going to cover them. 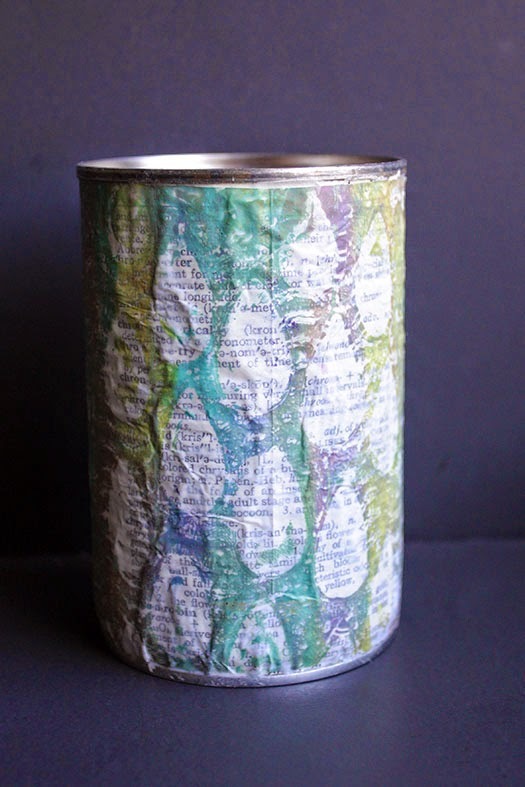 I've previously made tin can pen holders with scrapbook paper and ribbon (above), but I wanted to try something a little different this time around. . .layers. Here are my instructions for you on how to achieve those layers. 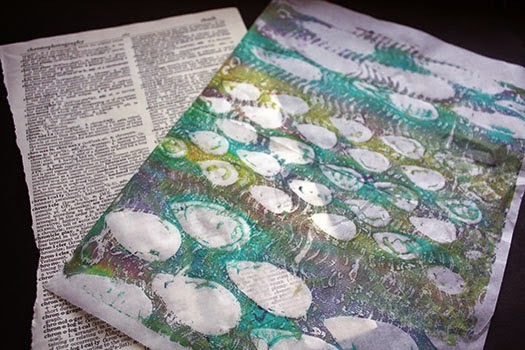 Start by picking out a page of dictionary text along with a gelli print on deli paper. Make sure there's lots of open space on the deli paper so you can see the dictionary text through it. 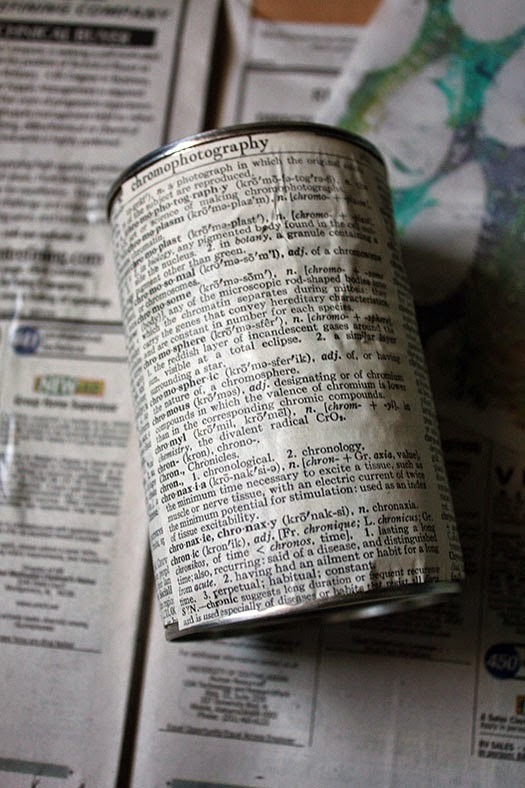 Gather the rest of your supplies: tin can, paintbrush, & glue (I used white school glue on the dictionary text and gel medium on the deli paper, but it really doesn't matter as long as the glue dries clear). 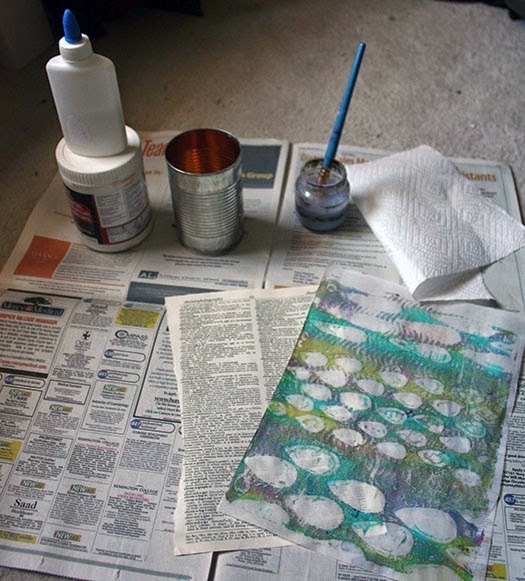 Lay these out on a covered surface. 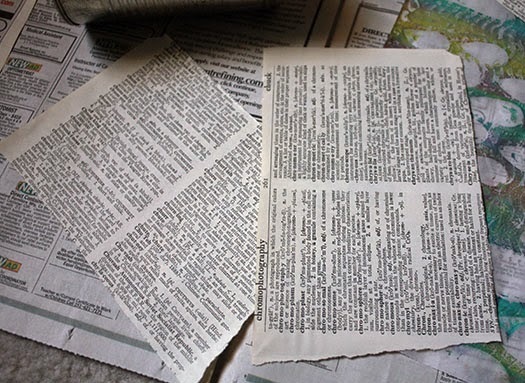 Measure and cut your dictionary page down to size, using multiple pieces if you needed to cover the can. 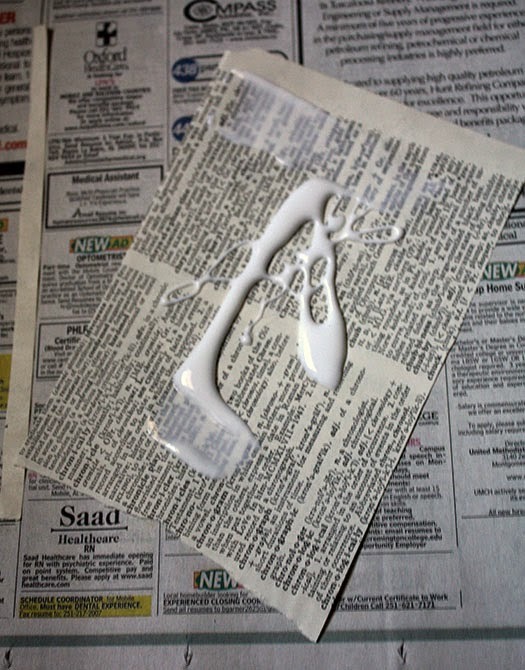 I made a mess with the glue since the cap was clogged. Ooops. 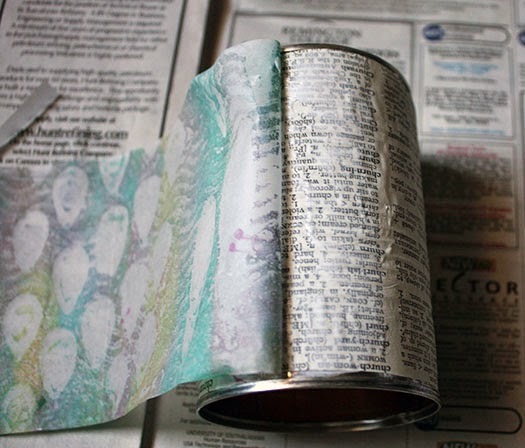 Adhere the page(s) to the can, gently pressing out any bubbles/glue without tearing the paper. 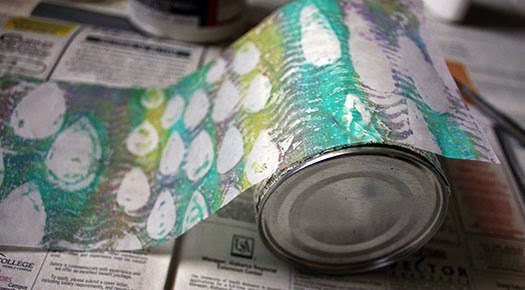 Measure and cut your gelli-printed deli paper to the size of the can, leaving a little overlap on the ends. 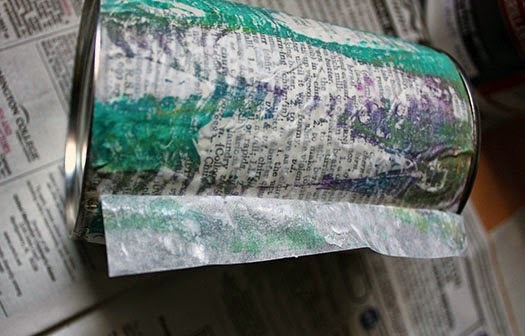 When you get to the last section, apply the glue to what remains of the deli paper and press down. All it needs now is something to fill it!I didn't have any trouble coming up with that part. 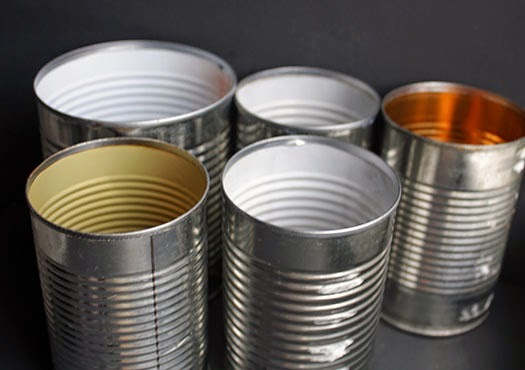 I still have several tin cans and lots more supplies so you may see some more tin can makeovers here in the future. 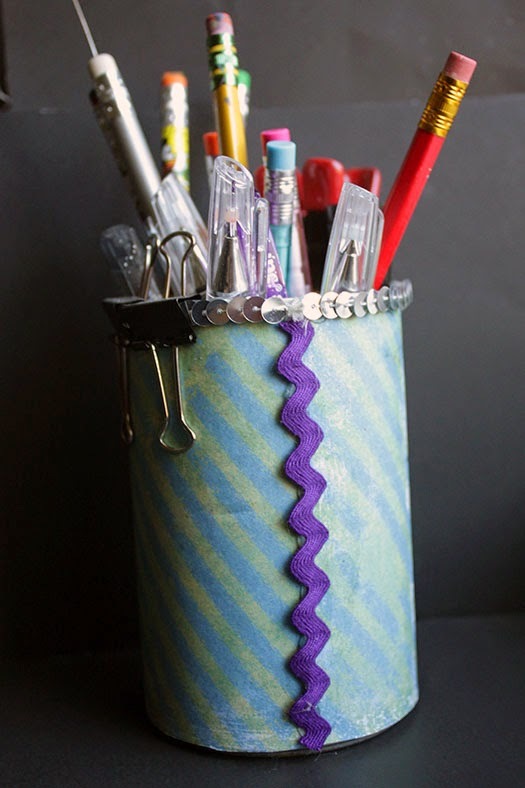 This is a simple project and a perfect craft for kids too. Isn't it funny how great storage is sometimes right under our noses . . . or in our cabinets? Love your idea, and it's so economical, if we change our decorating scheme, we just toss them and start again. Always plenty of cans around. Very pretty idea. I just took a class in making mono prints with gelli plated and I made some really attractive notecards by mounting then on card stock. Kathy- aren't the gelli plates fun!? I'm so addicted to mine, I have to keep reminding myself that I'm a jewelry-maker. I guess I better find some way to work these into prints. . .ooooh, or maybe I can use your idea of the notecards to include them in my packaging. Aha! You're a genius!! Thanks for the fab idea. 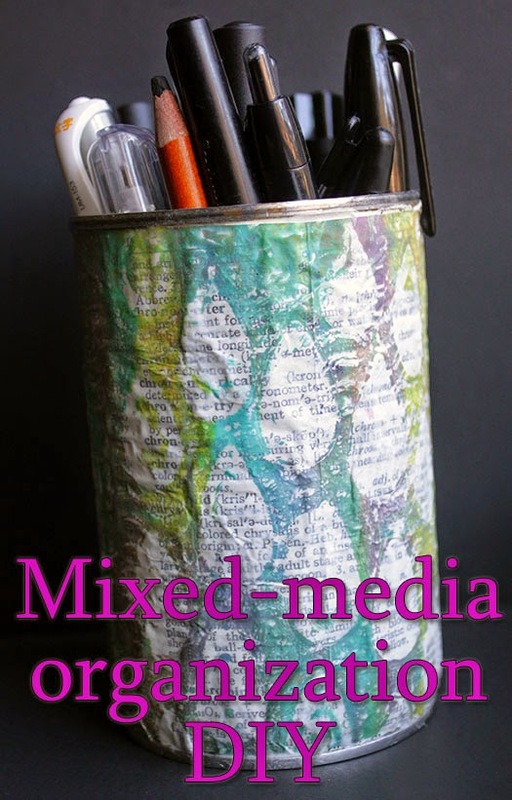 Now that's a good use for your paper crafts!I have decorated some tins myself and use them instead of buying any! What a wonderful repurposing project and so creative too! These is great! I also like to use the scrapbook paper in the many different designs and modge podge them on. We have A LOT of these around our home! Thanks so much for taking the time to pop over here!